The meaning that Leo Babauta at http://mnmlist.com/wash-your-bowl/ inferred from this story was both profound and completely different from what I realised whilst reading it. I hope you see something different too, this story is really simple and really big at the same time – which is what minimalism is all about. The concept of cleaning your bowl once you are done eating is probably obvious – you just bung it in the dishwasher or dump it on the side then wait until you have enough dishes to wash to necessitate the cost of a sink full of water, right? Leo Babauta took different wisdom from this – that there is a sense of immediacy in the words that causes you to feel like you need to wash your bowl this very minute. So he does. He hand washes his clothes once they’re dirty then hangs them up to dry. I thought it could also have a wider meaning – that applies to the work that I need to do to clear my house – a lot of the things I’m keeping hold of are things that I’m done eating with. They’ve had their day. By holding on to all this crap in my house, I’m not washing my bowl. And all the dishes are piling up and festering in my soul and suddenly I don’t have enough spoons. Basically, it started from Year 9 maths (don’t worry if you can’t follow this paragraph), with the quadratic equations, where you had to expand the equation then simplify it, and suddenly this horrible mess of brackets and letters became an even more horrible mess of x- to the two and minus y and numbers. It looked like a child had sneezed on an alphanumeric scrabble board. This is especially true at A-level when you get more than two sets of brackets, such as (x + 3) (x+2) (6x + x). That expands out to: (x squared + 3x plus 2x + 6) (6x + x) then becomes 6x cubed + 18x squared + 12x squared + 36x + x cubed + 3x squared + 2x squared plus 6x. What a mess! But once you start grouping items together and combining signs and working with what you’ve got, you suddenly get something really simple; in the case of the example above, 7x cubed + 35x squared + 42x. 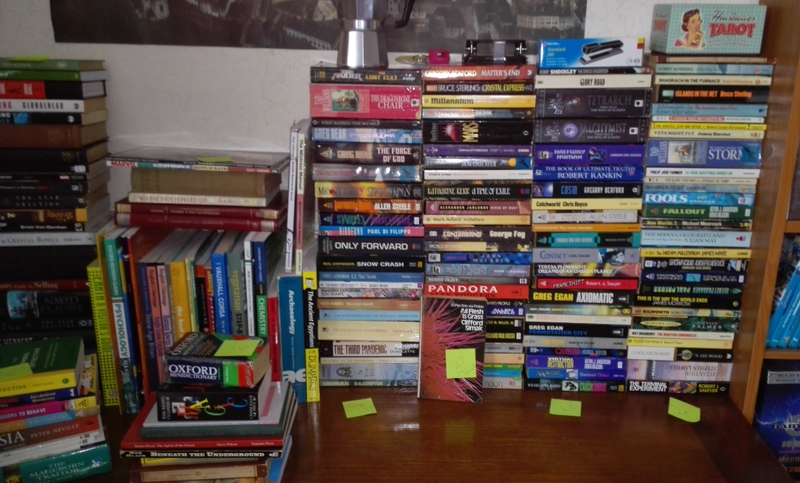 When I started to tackle the mess it seemed like it had gotten worse – I am about one third of the way through my book clearance plan, which has so far unearthed about 250 books that are all unwanted. That’s about 50% of the 500 books I’ve assessed so far. One in two of the books I’ve checked weren’t worth keeping. What it meant, though, is that I had displaced books all over my living room that needed to be removed from the house. They are mostly gone now, but a few stragglers are left over (my OH insists that he knows people who want them). My car was full of DVDs to sell at CEX for the same reason. Now it’s empty again. This is what I mean by expanding and simplifying. You get the stuff out to assess it, and it expands. Then you pare out what you don’t want, separating it from the things you are keeping, then you return the things you are keeping to their permanent home. Then you remove the other stuff from your house. However, in order to simplify, you need to be able to decide what is important to you right now – not what was important ten or twenty years ago. Except for anything tax related (keep that). The bowl was important whilst you were hungry – perhaps you imagined it filled with tasty food. The bowl was important whilst you prepared the food, as well, and it had a significant role to play in the eating. But it is not a living thing. You are not doing it a disservice by cleaning it. You don’t need to keep all those bits of stuck-on food to remind you of the meal you had. I found this train of thought very helpful while I was trying to clear out my sentimental pieces – those things you keep because they are “keepsakes” or they “were your grandmother’s” (who you never met) or because they mark what society tells us is a significant turning point in life, such as the 21st birthday. I got rid of things in all of those categories, so that my keepsakes were things I genuinely wanted to keep, because I was happy to see them and they reminded me of things I had done that I’d forgotten about and liked remembering. The only exception to this was my grandmother’s funeral card, because it’s the only photo of her that I have. 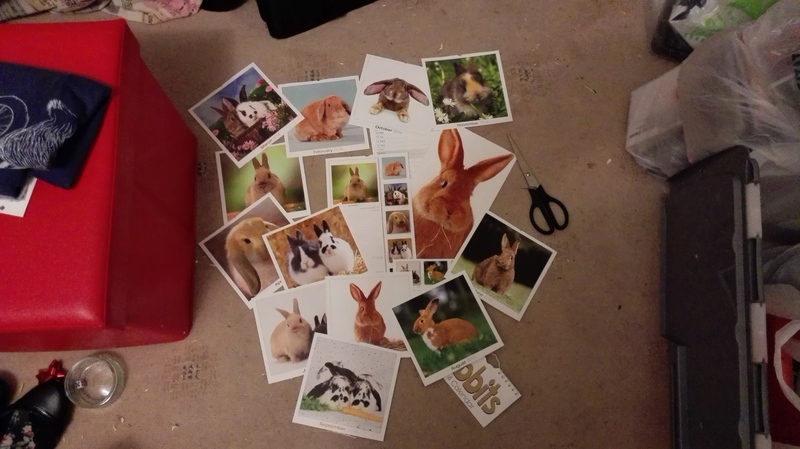 Speaking of photos, I also got rid of photos and cut down old calendars. This was a lot easier than I expected. For a lot of them, if the quality was ok, I saved time and snapped them with my phone (I took a photo of a photo), because scanning is a bit of a faff and takes longer than phone photography for a fairly similar result. A lot of photos didn’t even get immortalised with a phone photo, I just chucked them out, because they were unimportant. They were the dried-on porridge that was caked around my bowl, and it was difficult to see where the porridge ended and the bowl began. I still have some way to go, but a good example of how this helped me is that I had a giant pink plastic box with all my best stuff in it. I was originally clearing the rest of the house to make room for its contents to finally come out. Imagine my surprise when I started clearing it, only to discover that my 70 litre box of what I thought was my most important possessions turned out to be full of mouldy porridge, with a decent spoon inside (the three things from the box that I ended up keeping). I’m glad I started questioning everything. I’m glad I stopped assuming that mouldy porridge was part of the bowl. Because, even though our house got quite messy this week, we got it clean and tidy in under 2 hours yesterday ready for a house party, because we’re no longer trying to polish bits of old porridge (or deluding ourselves into thinking the porridge is the bowl). On an even deeper level, I want to travel and experience new things. How can I experience anything new if my bowl is already so full that I can’t fit any new experiences into it, even just to eat them? Have you cleaned your bowl recently? If it’s looking tatty, start digging at it. There might be a bright shiny bowl under all that old porridge!